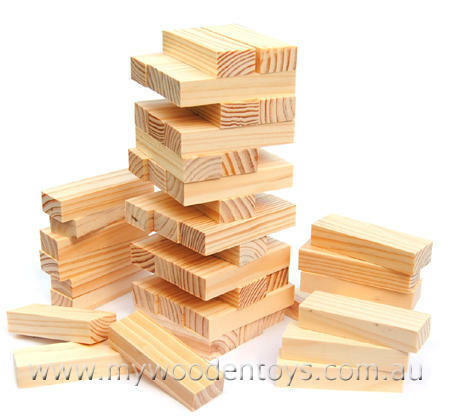 Tumble Tower Wooden Game contains 48 wooden blocks which you build into a tower. You then take turns removing blocks one by one trying not to let the tower tumble. This is a really fun simple game and one that children of all ages love. It has been called many names the most popular being "Jenga". Rules vary but the idea is to remove a block and place it on the top to start another level and so on until it all collapses. The blocks in this game are also wonderful to build with and can be put together in all sorts of shapes and patterns. Size: Blocks are 7.5cm x 2.5cm x 1.5cm The whole tower is 24cm high. We like this because: " Great game and lovely set of building blocks in one ."